Solar powered motor controls generally come in 2 forms – those that are powered by batteries and those that are powered direct from the solar panel output. Depending on which option you’re looking at will have an impact on the best way to setup the motor controller. However, there are a number of commonalities between the two power sources. Firstly, both will output power over a changing voltage range which can vary quite dramatically. If you are looking at powering a motor controller from a solar panel connected to a battery then we would suggest that you have a look at our page on battery powered motor controllers as this has a lot of relevant information on the key issues involved in this from protecting the battery to optimising the controller to get the most performance from the changing power supply. The most obvious and significant challenge with running any electronics from a solar panel is how to compensate and account for the changeable power input. This can be achieved in several ways. The simplest way is to use a discreet ‘dumb’ driver which will run if it has enough power coming into it and won’t run if it does not. By only using discreet components there are no issues with microcontrollers running on unstable voltages. However, for the majority of applications the use of these simple circuits is simply not enough for what is required for the application. In these circumstances, the only real option is to use a more intelligent system but build in all of the intelligence required to operate this in the most effective way possible. 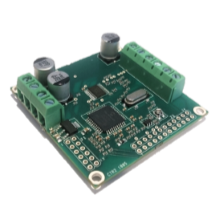 One of the most important functions on a motor controller in this type of application is to carefully monitor and measure the input power so it knows exactly what it has available to it at any one time. By monitoring this on a regular basis, any changes can be quickly seen and addressed. 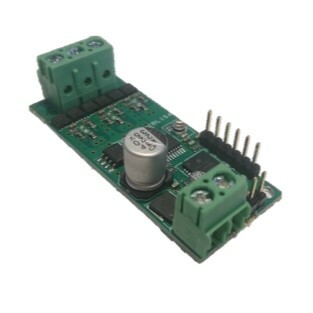 This monitoring then enables the controller to assess what it can do with the power input and to operate accordingly. For example, as the sun rises in a morning the controller will not have enough power to drive a brushless motor at full power. However it will be able to switch on the main controller and signal any alerts or statuses as required. As the sun rises further the unit can then monitor the power input and drive the motor accordingly. Depending on the type of motor being used and the requirements of the application it can then make the best use of this power in either speed or torque. The key point to remember here is that, by using intelligent controllers in this way it is possible to get the best possible performance from teh power avaiable. A common issue with solar powered applications is (often by definition) that they are being used in remote environments. This can make it hard for the end user to regularly check on them and therefore makes regular reporting and status outputs hugely important. These can be designed into the application however you require, from LEDs and/or alarm type outputs to SMS or other networked communications. In addition to this it is also possible to use onboard data logging to record key data that has been monitored throughout the day. This can be used to identify issues in the application such as wearing parts, reduced efficiency and a range of other options. Put simply, the user can be as well informed or as ill informed as they would choose to be. A further consideration with this type of electronics is how best to address the challenge of tracking the maximum power point. This involves monitoring the voltage and current output of the solar panel and constantly adjusting the power output of the controller to reflect the optimum power point at the particular time. This is a constantly changing point as the day and weather moves on but intelligent controllers can address these challenges effectively and promptly in order to get the maximum possible performance from the power output of the solar panel.